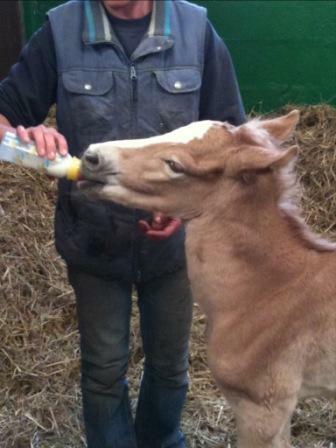 Arthur is our orphan foal, unfortunately we lost our wonderful mare Mona shortly after foaling, however she leaves behind a beautiful colt foal alongside her other progeny which we have. Arthur has been growing on successfully whilst we are hand rearing him and turning into a very strong, good moving and healthy boy. 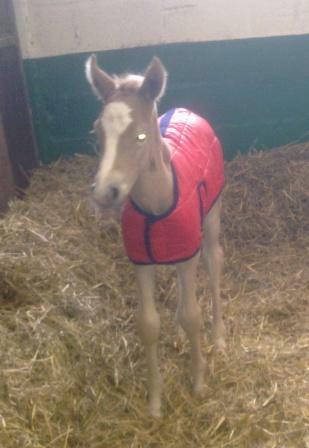 At present he is nearly two weeks old and is as bright as a button, we hope we can continue to let everyone know he is doing well and rearing perfectly!!! His temperament is adorable, even if a little forward which is to be expected and we are hoping in due course to introduce him to our herd of mares and foals so he can lead as normal a life as possible. Arthur has the looks to go with his superb conformation and movement and we feel he will go far and be yet another successful addition to the Bathleyhills prefix. 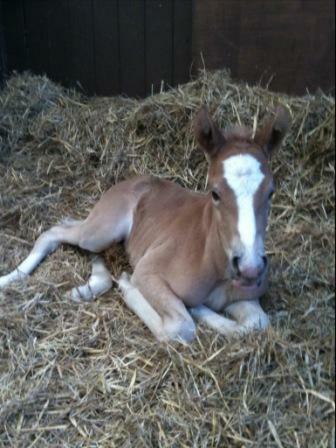 Sadly our beautiful Mona passed away after foaling a gorgeous chestnut colt, who we have named Arthur. He arrived at 3.15am and we are hoping we can rear him successfully!! 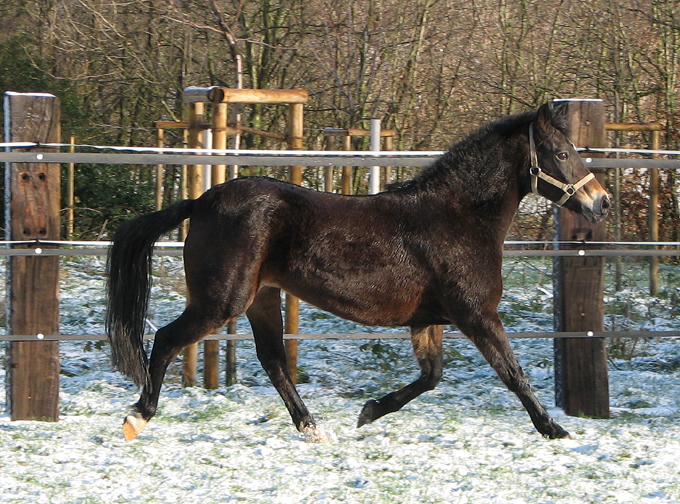 FS Don't Worry is one of Germany's most outstanding pony stallions. 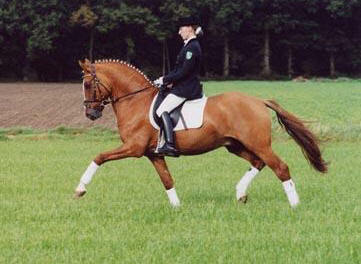 He was reserve champion of the riding pony koering in Aachen in 1998, the same year he won the NRW riding pony Championship for the first time, and which he repeated in 1999. Don't Worry won the Bundeschampionat for riding ponies in 1998 and 1999, receiving six perfect 10's! He won his stallion test in Muenster-Handorf, and has multiple wins in dressage in M and S classes, Intermediar I and Prix St. George. Don't Worry won a bronze medal in the Rhein championships and was fifth in the German junior championship under Miriam Licinio. 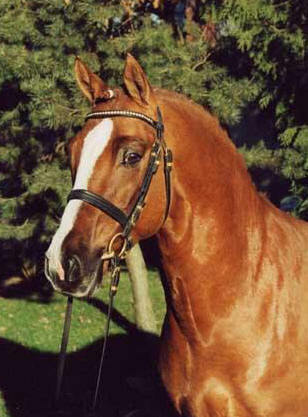 His sire, Dacapo Doro, won at Hickstead and grandsire Derano Gold was European champion. Dam, Golden Sunlight, is a Bundeschampion. Some of Don't Worry's notable gets include 2001 koering champion Daily Hero, 2002 federal champion Dark Magic, 2002 federal champion Don't Forget, 2003/2004/2005 federal champions Dinarion, HB Dreamgirl, HB Daylight, HB Golden Girl, Don't Thatch. At the 2002 riding pony koering, the top five ponies were by Don't Worry. In short, he has too many outstanding offspring to list!